The toolbar on Evernote 5 Beta can't be customized. I can't put commands/functions such as "new note", "new notebook", "print", and so on there. Shouldn't that be even covered by the Mac OS design guidelines, as the customization of the toolbar is in every (other) mac program? You don't know what you have until it is gone, and now I miss those forward / backward buttons. I want my monthly usage meter back! I agree. I missed forward / backward buttons and the monthly usage meter. Yep, why no customizable toolbar?????? Also, it's not very intuitive for adding sub tags. The ability to right click on a category tag and add a sub tag to the category (like the previous version) would be nice! Also a note count for the sidebar tag list (again, like the previous version) would be a welcome return as well..
+1 vote for customizable toolbar, and specially the forward / backward buttons. +1 - I NEED my customizable toolbar. I thought this was supposed to be standard across Mac apps? Not only to add commands, remove unneeded ones, but also to shuffle stuff around and place the toolbar buttons/commands where I can get to them the most quickly depending on the context of how I'm working. And including the ubiquitous Space and Variable Space components too, so we can do a completely customized layout of the toolbar. A customizable toolbar is pretty basic, please bring it back. ALSO, we need to be able to drag and drop notes into tags. ALSO, on the iPad, please give us back the snippet view and sort by creation date. Agree. I miss being able to have my own toolbar, and it feels really, really weird not to be able to customize it. It's a basic feature. I thought I was going mad trying to get the customisable toolbar to work. +1 for that. And not wishing to sound like its all bad, I am liking the new mac client. I like the shortcuts; particular that you can throw anything in there. Was glad to see sort by create date was present after its omission in the iOS versions. Forward and Backward buttons please! Yes, PLEASE re-instate a customizable toolbar. Ditto. Yo quiero customizable toolbar. I'm so tired of seeing the shared notebook button turn blue and having to click it to dismiss it. I don't care when someone updates a shared notebook; I'll see it when I look at the note, since I sort by date modified. ... but not being able to customize a toolbar in the app is just ... blech. Trash is at the top of the the note editor on every note. One of the reasons I used the trash in the (customizable) toolbar was for deleting a multiple selection. Sure, I can do this via right-click. I appreciate the UI change, now putting file-level controls in the right place, and reserving the top toolbar for application level controls. As it works now, if I multiselect, in the preview panel below I get a widget with controls for doing all the functions I can do to a single selection - except one, which is delete. I agree -- please allow us to customize the toolbar. Thank you. Please allow toolbar customization. Removing features that I use reduces the reasons I use Evernote. Yup. I'm so tired of seeing the satellite dish icon flash blue whenever someone in a shared notebook changes a note. I don't care when someone changes a note, and it's annoying to have to keep clicking it to turn off the blue highlight. I like that Evernote takes the initiative to put in new features and streamline functionality, but I hate when they do it in a "This is the right way, and everyone will agree and use it like this" way. I'm sure there are people who really like the shared notification, but it should have been added with an option to turn it off or to customize the toolbar so that people can still use the program they pay for in the way they want. Evernote doesn't always know best, but they implement features like they do. Ugh. It's almost June, and still no customizable toolbar. Could we at least get an option to remove the blue satellite dish icon? I hate that thing. What would you like to customize besides removing the Activity Feed? I would like to be able to move or remove everything. For instance, I'd like to be able to move the search field to the far left and remove everything else but the "new note" button. I would also like to see the return of buttons to create audio and FaceTime notes. And something that annoys me daily is the view switcher; with its current placement it travels all over the screen, it would be convenient to be able to fix it to the menu bar. The activity feed is just my own pet peeve; everyone will have their own desired configuration for the menu bar. The real issue is that it's 2013 and the Mac client doesn't have a customizable toolbar, which most people consider a boilerplate feature for modern software on any desktop platform. In fact, EN, as great and useful as it is (and I love it) lacks some basic UI customizations that are common everywhere. These are not just minor annoyances, they are productivity issues, really. Seems like EN stopped improving a year ago, at least in the front end. I know it didn't but it feels like it. I think it is a fairly critical time for Evernote. If someone else comes along with a competing product that has a better, more customizable UI, how hard is it to just more everything to the new app? Not too hard. I miss the monthly usage meter & we need to be able to drag and drop notes into tags. "Show Tag List" seems to be always grayed out. A customizable toolbar is a MAC feature. It should be in a Mac app like Evernote. Otherwise, we know you are simply porting over the PC version of Evernote to the Mac. 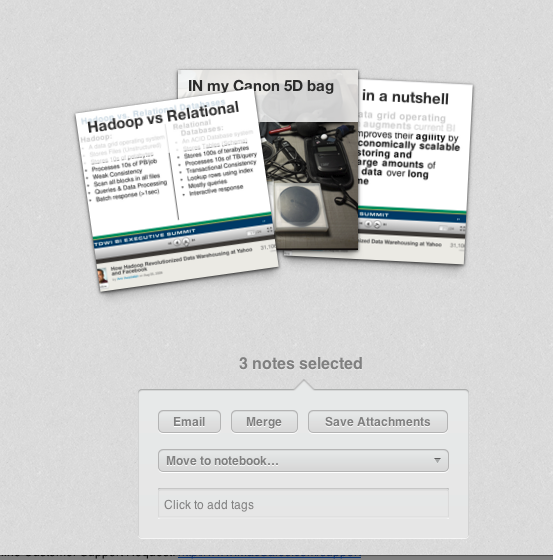 jcarman, Evernote for Mac currently supports dragging and dropping notes onto tags in the sidebar. Actually, a customizable toolbar is a Windows feature as well, and you'll see it not only in Evernote on Windows, but in other Windows apps as well. Whatever you think of the Mac app, I think it is a stretch of the imagination to see it simply as one ported over from Windows. I think the Mac app has been around from the beginning (http://blog.evernote.com/blog/2008/06/24/evernote-public-launch/), and in my experience it has always been considerably different in look, feel, and function than the Windows one. Sometimes this is good, sometimes not so good, but I don't detect mimicry here. As for the toolbar, it isn't a big deal to me personally, but since I am forced to keep it open (a longtime complaint of mine that hiding it also hides the search even from the shortcut keys, so I cannot realistically use Evernote without the big empty space the toolbar occupies on my screen) I figure we might as well have functionality. If we went to something like Notational Velocity (another Mac app without a customizable toolbar) that just had enough space for a search bar, I'd be more pleased with it than if they added a bunch of options I'd never use. Indeed. I had to poke around to find it. Tags can be shortcuts as well, I see. Thanks. If E5 is not pleasing, roll it back to E4 as I did. E4 is available at FileHippo.com I got my customizable toolbar back and the Usage meter. E5 does have some cool new features, but they are not indispensable. How long the-powers-that-be at Evernote will let me run with the deprecated version I don't know, but for now I am happy. I've used Evernote a couple of years, and enjoyed the evolution of the UI. Today, I went to print (Gasp! He's using PAPER!) a note, a couldn't find the Print icon. So, I thought "Oh, I'll just add it by customizing the toolbar!" BZZZT!! I had to actually do a web search to affirm that I wasn't missing something (except a feature that is in most every other Mac app); I actually cannot add a simple PRINT icon to my note toolbar. Amazing. I know I'm setting the elusive paperless office back decades. But every once in a while, I just need to PRINT a note and take it with me. Really hope to see that on an update in the near future. Hi. You can still print. Just press Command + P. Or, in the menu bar, File -> Print. I prefer this to pressing an icon. However, I agree that a customizable toolbar would be nice, even if I don't personally need it, because I think a lot of people navigate the app with icons. At this point, more than a year into the current version, I am guessing that they don't plan on adding it back into the app. I am not sure why, but it seems the decision has been made to remove the feature. The comment I quoted is nearly 2 years old, and the ability to customize the toolbar is STILL not present? I'm on 5.5.1 (Mac) and there is no option to customize the toolbar. Just because the engineers/programmers/designers of the app like it this way, doesn't mean it's conducive to my working style or anyone else. For how awesome Evernote is supposed to be, it falls terribly short on some basic things (such as being able to see all my notebooks in the sidebar - why is this not also an option?). Seriously? All of it! Asking this question implies that the user must provide rationalization and/or direction for customizing the toolbar. It should never be a question of cherry-picking which aspect of the toolbar to allow customization - the entire toolbar should be customizable. Why can't you see your notebooks? Or am I misunderstanding your problem? Wow, okay thanks for the screenshot. There is no visual indication that I could enable this, nor from any drop down menu item. I right-clicked and found the option - thank you! In case it cannot be implemented for the time being, I'd request to change the way how the toolbar entries are handled. Let me explain. I'm used to clicking in the search box in the top-right corner for searching thru my notes. However with the last update, a new button was introduced for creating a work chat. When the Evernote window is not wide enough, the search field disappears, and then clicking in the top-right corner creates a new chat. That's confusing for me. I'd expect the new work chat button to disappear first when the real estate is not sufficient for displaying the whole toolbar contents. This search field disappearing problem is frustrating! I imagine people with 11" macbook airs are seeing this left, right, and centre! I have brought it up with staff in the Mac Version 6 Design Feedback thread and they are aware of the issue and seem to be working to resolve it (Who knows when...).